The compulsion to somehow make Weisser's lilypads/lotus flower pattern my own did not go away. So I made the lotus flower a little flying friend. 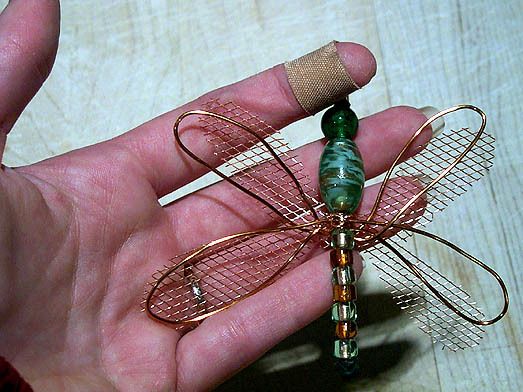 The dragonfly is made of copper wire, copper mesh, and glass beads in greens and ambers. Sheer optimism leads me to believe that I can find a way to securely fasten it to the face of the lilypads panel. It's that or hurt myself with the soldering iron, trying. Also, I almost forgot: remember Bob Ross? "Little happy trees" (doubtless the happiness was the direct result of a contact high)? It is my solemn duty to tell you that BOB ROSS LIVES. 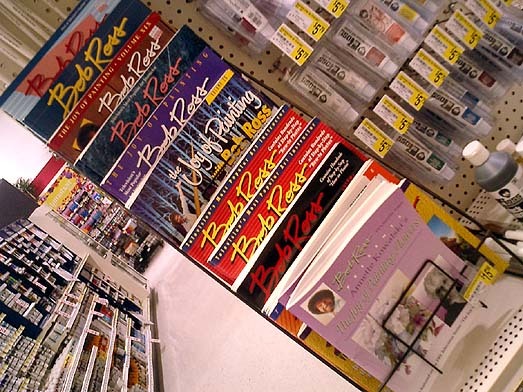 Specifically, at Michael's crafts stores. I did finish my copper foil class at Weisser. I haven't yet affixed my dragonfly to my lilypads panel, and may not bother, having discovered that the heat-conducting properties of copper tend to wreak havoc with any attempt to solder bead-stoppers onto copper wire. I did start a new class at the Art League last Monday. I did pick out a pattern to build in my new class; a tiered lamp of the sort that I still have no idea how I'd design from scratch, but am feeling masochistic enough to attempt building from pattern. I'm supposed to start cutting glass for my lamp at class tonight, but I seem to have come down with some sort of cooties of the sore-throat variety, so I'll be staying home tonight, all the better to concentrate on throwing my sleep schedule entirely out of whack by way of self-pity naps. The good news: there is such a thing as the National Capital Art Glass Guild. The bad news: they haven't updated their website in eight months. When will people realize that a web presence whose neglect is painfully obvious is almost worse than having none at all? The stink of disorganization will drive away potential participants, members, patrons quicker than you can say "all start and no finish." Weisser's spring sale was last week, and I barely made it out with my checkbook intact. Walked away with three 9x12s of green-mixed-with-red Youghiogheny stipple glass, and two 12X14s of Wissmach in an off-white that I think will be a perfect match for a planned twin for Protein's lamp, for thirty-one dollars. I think I love that store more every time I go. A nameless angel sent me a Nick's Grinder's Mate after taking pity on me for having made a mess out of one of my fingernails with the grinder recently. I'll be trying it out and reporting back soon, since I have a lampshade to get built between now and early June. The fingernail is doing MUCH better, thanks. I'm so glad mine grow fast. Don built a swanky new workbench for himself down in the basement a couple of weeks ago, which means that the old one looks even sadder than it used to (which is saying some), but also means that the old one is mine mine mine. Currently it's covered with a pleasing litter of copper foil backing paper and dragonfly drawings. I still have but one transom installed. The second of the set of three sure does look pretty lying on Don's spiffy new workbench though. Eve and I were at last successful in our quest to go see the Frank Lloyd Wright leaded glass exhibit at the Renwick this weekend. I have a few photos and a few musings to share, but not now (I find myself update-averse just lately, for no other reason than ennui; I'll get over it eventually). However, I did promise Eve I'd re-find a link I'd seen on Anil Dash's site about circa-1950s Frank Lloyd Wright designs for several buildings in Baghdad. None of the buildings were ever erected, due to a "military coup" that "put an end to this project." The precision of really well-executed architectural drawings is itself fascinating, though, and too it's as timely as it will ever be to consider an alternate reality in which U.S. bombs have destroyed some of the last buildings designed by the country's best-loved architect. I wonder how the keening and wailing over such destruction, over in that parallel universe, would compare to that over the theft and the mindless destruction of cultural and artistic treasures thousands of years old that has taken place in Iraq in our present, unlovely reality. While that story has become a hot one just lately, as the networks exhaust their last caches of film of pretty explosions, I still suspect that a lot of Americans just don't grasp the hugeness of what's been lost. For many of us, our sense of ancient history goes back exactly 227 years, and stops. From such a perspective, is the value of cultural artifacts five thousand years old truly comprehensible? It's like the difference between a million and a billion: mathematically quite precise, but in practical terms, completely abstract in the minds of most. There are riches, and then there are riches. If---for argument's sake---eight Frank Lloyd Wright buildings had been erected in Baghdad in the late fifties to early sixties, and if every one had been destroyed inside a few weeks of early 2003, that destruction would even so be nearly meaningless compared to all that has been lost in Iraq in the last few weeks.